Tributes are pouring in for a former Kelso laddie killed in an accident at a farm near Hume yesterday. Ian Whellans, Kelso’s 2016 principal, was found dead on Sunday morning. It is believed the 26-year-old had been in an accident involving a quad bike. A spokesperson for Police Scotland said: “Police in the Borders were called around 10.15am on Sunday, November 11, to a report of a sudden death on a farm near the village of Hume, Kelso. “A 26-year-old man was sadly pronounced dead at the scene, and the death is not being treated as suspicious. Widely known by the nickname Splodge, Ian led the Kelso Civic Week in 2016, and is said to have “epitomised what a Borders principal should be”. 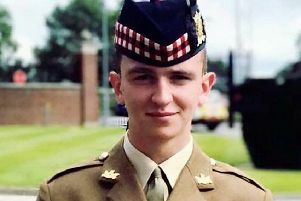 He also played for Kelso Rugby Club, and they will hold a minute’s silence in his memory at their home match versus Dumfries Saints on November 24. In a statement issued yesterday, the club said: “Ian was a true gentleman and his passing has left a real numbness all around our great town today. “Splodge, as he was known, was Kelso laddie in 2016 and he carried out his duties impeccably. “He also loved his rugby and played for Kelso Harlequins and also at a senior level for Kelso RFC. He was extremely popular amongst his team-mates and everyone is devastated by the news today. “Our thoughts are with Ian’s family and his many friends at this incredibly sad time. A spokesperson for Kelso Civic Week said: “Ian was a well-respected and much-liked young gentleman who was a credit to both the association and the town during his time as Kelso Laddie. He will be sadly missed by many, both near and far. Scott Irvine, of the Jethart Callants Club, said: “Ian, with his big smile and fantastic personality, made friends all over the Borders and especially here in Jed. He epitomised what a Borders principal should be.